VALLEYLIFE’s 27th Annual Golf Tournament was held the first weekend of March at Ocotillo Golf Resort in Chandler. For the third year, VALLEYLIFE’s tournament was dedicated to Aidan Warrington, a long-time supporter of VALLEYLIFE. It was a beautiful day and players had a great time. At registration, players were given a chance to purchase raffle tickets for some great prizes including getaways, golf outings and gift baskets. Contests and activities were held throughout the tournament. Dinner was served when the golfers returned to the clubhouse. After short remarks from VALLEYLIFE’s President and CEO, Cletus Thiebeau and Director of Fund Development, Margaret Stephens-Reed, an awards ceremony was held. The Fruth Group foursome won first place again this year with a team score of 57. Coming in second was Cash, Sullivan and Cross, and close behind in third place was Rush Truck Center. Gompers won the Most Honest award again this year. Other award winners included Closest to the Pin, Marty Block; Men’s Longest Drive, Jason Lucero; and Woman’s Longest Drive, Brenda Heyink. The program concluded with the announcement of the raffle winners. VALLEYLIFE would like to thank all the golf tournament sponsors, volunteers and donors who worked to help VALLEYLIFE further their mission “to enhance the quality of life of people with disabilities”. If you missed the chance to participate in this year’s golf tournament and would like to be included next year, please contact Margaret Stephens-Reed, Director of Fund Development, at 602-331-2414. 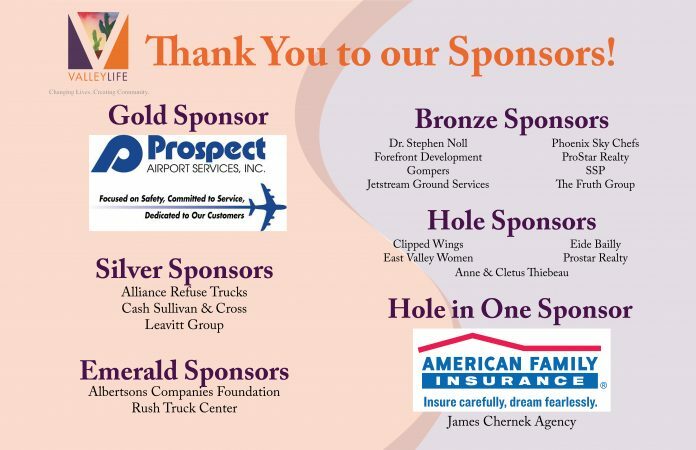 To view all our upcoming events please visit www.valleylifeaz.org/events. VALLEYLIFE is a nonprofit organization that provides services to individuals with disabilities. This is done through our wide range of programs including residential group homes, day programs, vocational services and in-home care and support. All proceeds from this tournament will be used to meet the many unfunded/underfunded needs of VALLEYLIFE Members, such as prescription copays, eye exams and treatment, physical and speech therapy, vocational training, job placement support, group activities, and outings including participation in Special Olympics. Previous articleNeed Help Passing Your Arizona Private Process Servers Licensing Test?